As of Thursday Vongfong winds were as strong as 105 knots (194.46 km/h) and gust up to 150 knots (277.8 km/h), with wave height reaching 15.25 m. It is expected to be to 260 km/h in the coming days. 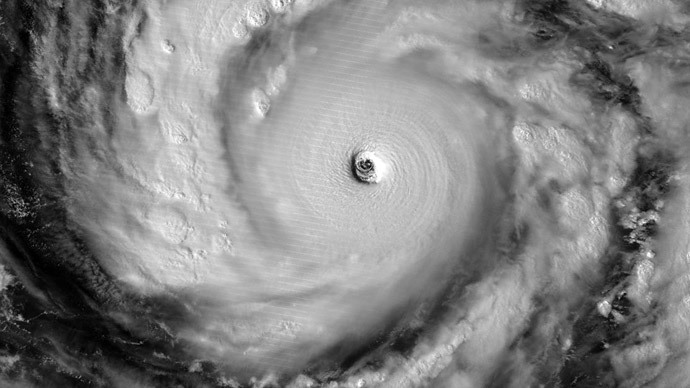 Typhoons graduate to 'super' status when winds reach 150 mph (241 km/h). Vongfong is the strongest tropical cyclone of the year, and the strongest since last year's Typhoon Haiyan which featured 315 km/h winds and devastated parts of the Philippines, leaving over 8,000 dead and more than 1,800 missing. "Its strength is very much similar to Haiyan (Yolanda)," a meteorologist at the Japan Meteorological Agency told AFP. The typhoon is going on open water now west- northwest in the western Pacific Ocean , according to the Hawaii-based Joint Typhoon Warning Center (JTWC). It’s moving at a speed of 8 knots (14.8 km/h), the Japan Meterological Agency said. Government officials in Guam, Saipan, Rota and Tinian reported minor damage from the hurricane and heavy rains on Monday. Vongfong passed through U.S. islands in the Marianas earlier this week, but little damage was reported. If it stays on its course it will fall on Japanese Okinawa island and then, weakened, on Kyushu island and close to South Korea. The worst Vongfong impacts on Japan are expected some time over weekend. Vongfong is expected to continue strengthening over the next 24 hours but could lose some steam as it heads north. “Normally, typhoons are strongest when they are in the Tropics. They start to gradually weaken as they move into the subtropical region and the temperate zone,” the meteorologist said. Typhoons are the same type of storm as hurricanes; they're called typhoons in the western Pacific Ocean. The previous severe weather alert, generated by Phanfone, caused more than 1.2 million people to be evacuated to shelters, disrupted air and rail travel as well as the search and rescue efforts for missing people.